Indonesia is known for its coffee. Among the famous coffee produced here are toraja kalossi, mandheling and gayo. Last but not least is the noted civet coffee or kopi luwak, made famous by Jack Nicholson in the movie The Bucket List. It is the most expensive coffee in the world, sometimes hitting $160 per pound. “Good coffee tastes like fine wine. The better it is the more expensive,” says Pranoto Soenarto, chief operations officer of PT Excelso Multi Rasa, a unit of PT Kapal Api Global, the country’s largest coffee producer by volume. Yet much of what Indonesia produces is not fine coffee. Arabica production represents only 15% of total annual output of 690,000 tonnes last year. The rest is robusta. Indonesia is now the world’s third-largest producer of coffee by volume after Brazil and Vietnam. Indonesia’s domestic market shows great promise. According to the latest data from the Association of Indonesian Coffee Exporters (AEKI), Indonesians consumed 170,000 tonnes of coffee last year, or 700 grams per person—much less than the North American average of 4.1 kg per person a year. As incomes rise, they are willing to trade up for an “affordable” luxury such as a better cup of coffee. Specialty coffee chains, such as The Coffee Bean & Tea Leaf, Segafredo and Starbucks as well as local ones such as Excelso, are all expanding. Ironically, in areas where some of the world’s best coffee is grown, such as in Tana Toraja, it is hard to find places that serve the local brew. Most of the best is exported. “We need to condition Indonesians to become coffee drinkers,” says Pranoto. Pranoto Soenarto showing the green beans in Rante Karua coffee plantation, Tana Toraja, South Sulawesi. Photo by Ahmad Zamroni. 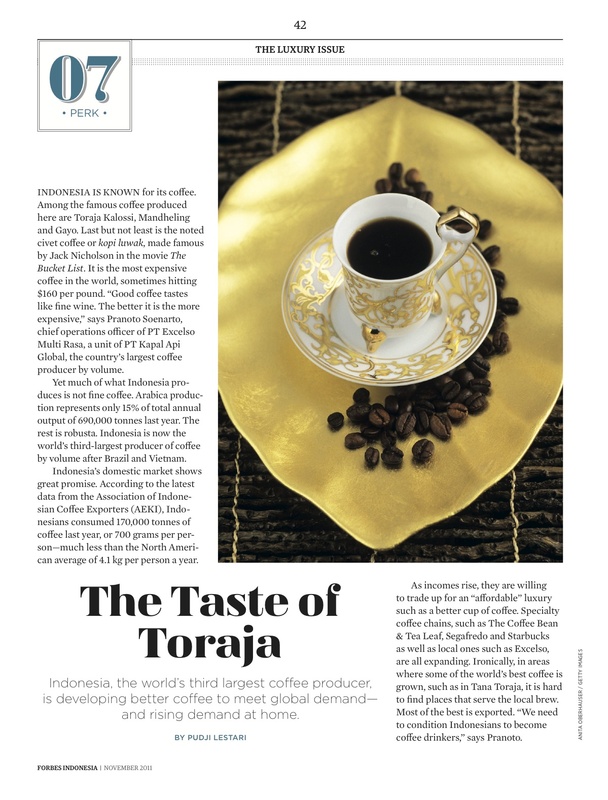 Driven by demand mostly from Western importers, Indonesian coffee producers are upgrading themselves and producing more single estate and even micro-lot coffee (the best coffee from within a single estate). A prime example is the Rante Karua coffee plantation in Tana Toraja, about 450 kilometers north of Makassar. In a small location known as Bolokan, it is 1,500 to 1,700 meters above sea level, the upper end of the range of where Arabica coffee normally grows. The plantation was originally started by the Dutch colonialists, then nationalized and finally turned over to a unit of Kapal Api. This area produces some of the world’s best Sulawesi coffee. One of the most discerning coffee retailers in the U.S., J. Martinez, calls it “one of the world’s premier coffees” and sells it for $14.00 a pound ($31 a kilogram), under the name of Celebes Kalossi Toraja “Rante Karua Plantation.” Sometimes the same coffee is sold under different variants of the name, such as the Bolokan name or the Sulotco name, derived form PT Sulotco Jaya Abadi, the unit’s formal name. Whatever the name, the coffee is still grown and processed in a traditional manner, hand picked and then sun dried. It is also organically grown. The Rante Karua plantation only produces 300 tonnes of coffee per year. The yield is half that a typical coffee plantation in Indonesia, 800 kilograms per hectare. At the moment, about 90% of Rante Karua’s harvest is exported. 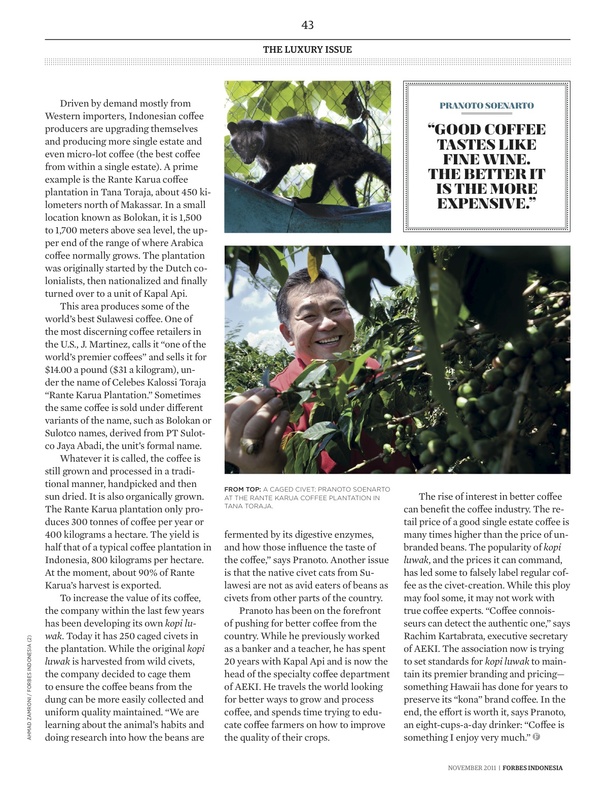 To increase the value of its coffee, the company within the last few years has been developing its own kopi luwak. Today it has 250 caged civets in the plantation. While the original kopi luwak is harvested from wild civets, the company decided to cage them to ensure the coffee beans from the dung can be more easily collected and uniform quality maintained. “We are learning about the animal’s habits and doing research into how the beans are fermented by its digestive enzymes, and how those influence the taste of the coffee,” says Pranoto. Another issue is that the native civet cats from Sulawesi are not as avid eaters of beans as civets from other parts of the country. 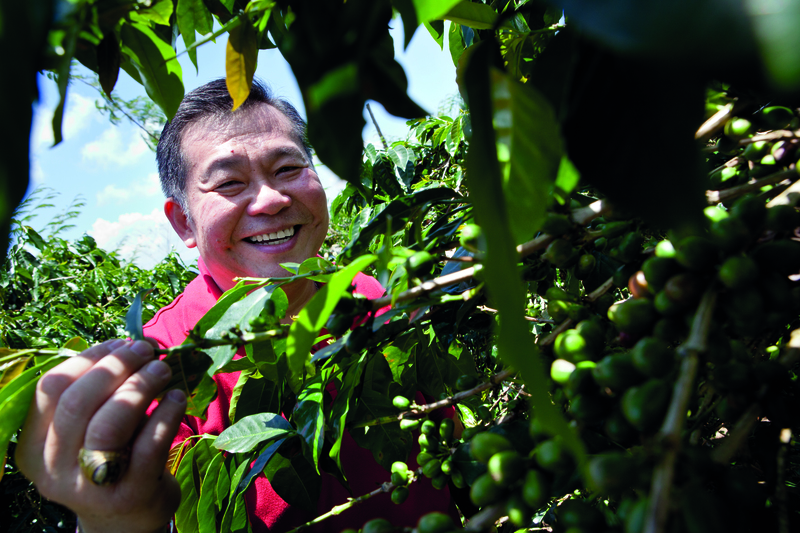 Pranoto has been on the forefront of pushing for better coffee from the country. While he previously worked as a banker and a teacher, he has spent 20 years with Kapal Api and is now the head of the specialty coffee department of AEKI. He travels the world looking for better ways to grow and process coffee, and spends time trying to educate coffee farmers on how to improve the quality of their crops. 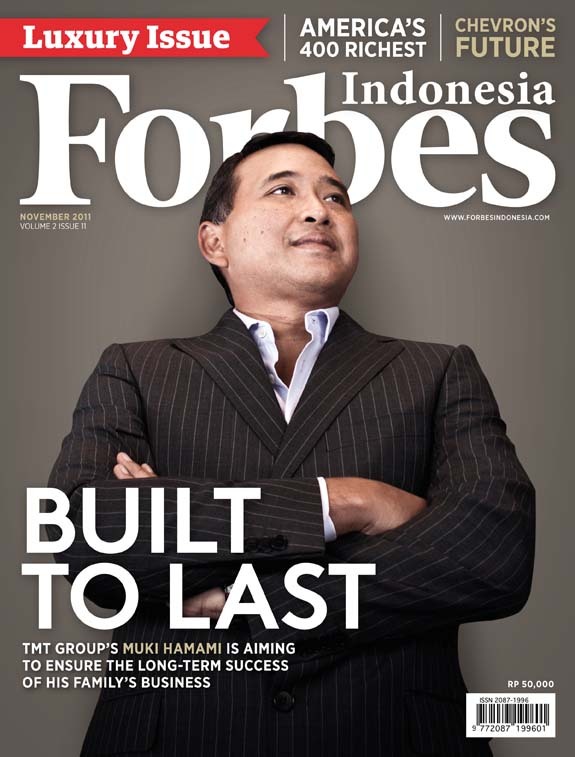 * This story appears in the November 2011 issue of Forbes Indonesia magazine. This entry was posted in Companies, Places, Publications and tagged AEKI, Asosiasi Eksportir dan Industri Kopi Indonesia, Association of Indonesian Coffee Exporters, civet coffee, kopi luwak, Kopi Toraja, Pranoto Soenarto, PT Excelso Multi Rasa, PT Kapal Api Global, PT Sulotco Jaya Abadi, Rachim Kartabrata, Rante Karua, Tana Toraja, Toraja Kalosi by Pudji Lestari. Bookmark the permalink.